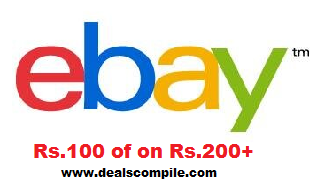 This Diwali, Ebay has launched a New Special Coupon by which you can get Flat Rs.100 OFF on Order of Rs.200 or more which is Valid for New users only with varying Shipping charges from Product to Product. 1.Valid on new accounts 1st purchase. 2.Coupons are not valid on Deals of the Week, 1 Day Flash Sale, Deep Discounted Products or where the listing has called out that eBay Vouchers are not applicable on that specific listing”.